What if the world, you know, was about to end during your lifetime? What if the decisions you made were pivotal in the salvation or destruction of the world? How would you react? What if you had the ability to go back in time to those pivotal decisions and change your response creating a new outcome (but creating further problems down the road that can still lead to the end of civilization)? How would you react? In Radiant Historia, for the Nintendo DS, you are confronted with this concept. In this turn based RPG, you play as Stocke, a special intelligence agent from the nation of Alistel. You’re assign to help your kingdom as it is at war with another nation called Granorg. During a dangerous missions, you unlock the power of a mysterious book called the White Chronicle. The White Chronicle allows you to determine a critical event in your past travels and choose another path. If you chose to go north on a fork road and you got your party members killed, travel back in time and go south (allowing you to keep your newly acquired stats, skill, currency, equipment, etc.) . In Radiant Historia, you are resetting the events of the game without pressing the reset button on you DS. There is a catch in the storyline of Radiant Historia. Changing an event in time gives Stocke a vague premonition about the future (that can be a pleasant prediction or a dark foreshadow of things to come). Unfortunately the game does not give you any indication was to what path will lead you to those premonitions or what future consequences will come altering your past decisions. In saving a friend, during a bad decision, your kingdom may be in danger of losing the war and you will be forced to make another tough decision ahead. With foreboding events appearing before you, the end of days riding on your decisions, and the ability to go back in time to take another route (whether it’s 2-4 different decisions for 1 event), Radiant Historia definitely gives you replay options without having to start a new game. You are granted the ability to take the road less traveled without wondering What if I took the other road? The concept of Radiant Historia has a unique ability to grasp for the RPG lover. If you are an RPG fan that enjoys turn based RPG combat, then this game is up your alley. The combat is very generic, but does have some new unique tactics to help. You don’t have the ability to go back in time during a battle (it would be a great addition for a possible sequel) but you can cluster enemies together in battle allowing one player to attack multiple enemies at once. The game also introduces change turns mode in battle, which allows you to change a character’s turns with another character’s turn in combat. This give a new approach to combat when you want your healer to fix up a party member before an enemy attack or when you want your strongest fighter to deploy the most damage with the cluster enemies function. When you are not in turn based combat, the game switches to an over the top view (much like you have seen in early final fantasy games or the dragon quest series) which can be a rather frustrating part of the series. This type of the game wants to play, like the legend of Zelda series, where you can move objects around to get to new paths and items, but doesn’t entirely work. With that being said, the story of war and changing the end of the world is intriguing and complimented by the nicely designed illustrations of characters throughout the games. If you’re an RPG fan looking for an RPG to try on your DS, Radiant Historia is worth giving a try. I know, after buying the game, I have never though, What if I spent my money on another game. 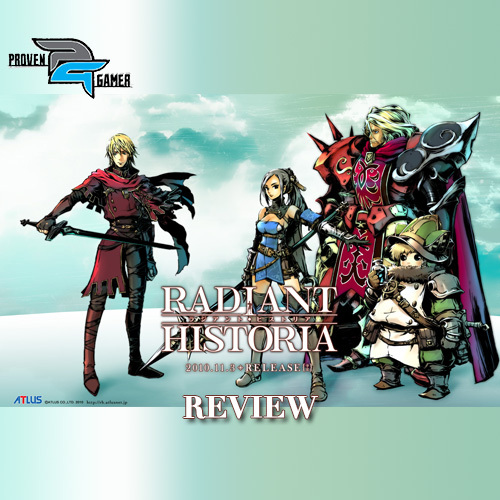 I give Radiant Historia a thumbs up for our ProvenGamer fans.